Within the life of Thompson Church there are boundless opportunities for mission and service, both within our congregation and in the broader community. We know that people have wide-ranging gifts and interests; our hope is to find a place that is a good fit for everyone in our church family. On the second Sunday of each month, Thompson Church hosts a free meal open to everyone in our church family as well as the local community. We need you, our members, to join us for the meal! Why is this important? The contact between guests and church members is the heart of Jesus’ teaching: I was a stranger, and you took me into your home. As we welcome these guests to our church home, so we welcome Jesus. No RSVP is needed - We will always have an open place at our table for you! 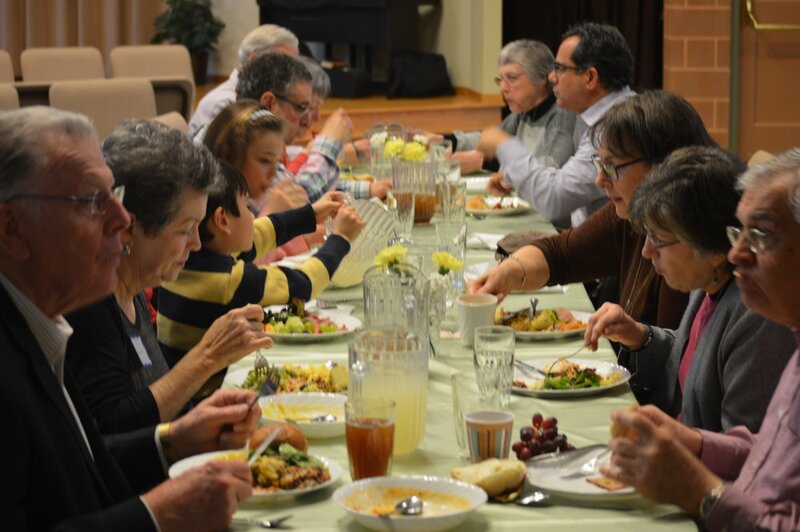 Congregational Members... We need your help to make each meal special. We need home-cooked food, volunteers to set up and clean up, and most of all we need you to attend and fellowship with one another and our guests. More info. Twice a year we leave the building on Sunday! In the fall, we cancel our usual services and become the church out in the community by participating in a day of service. In the spring, we hold a mini 'spring edition' of this event with fewer projects and without cancelling all services. We have projects for all ages and abilities. Some of our projects: pack breakfast bags at the church for shut-ins; pack hygiene kits for those affected by natural disasters; send books to our troops; pack 10,000+ meals, pick up litter along River Road; collect donated goods for a thrift shop that benefits local children; solicit food donations at a local grocery store -- you get the idea! You may also participate by donating books, household items, or food for a variety of projects. Check out our pictures from previous The Church Has Left the Building projects. Click a button below to check out the variety of Local Mission Projects and our Global Mission Partner. These projects range from local events to international mission trips. There is sure to be something for everyone! You can also learn how we serve our local Community through support programs.